Walk into pure opulence as you step inside Hillcrest Villa. Each home at Hillcrest Villa is just as alluring as its surroundings. Giving a touch of luxury in every element of each villa, take delight in blissful comforts such as free standing bathtub and spacious walk-in wardrobe. Furthermore, be absolutely awed as you step into Hillcrest Villa's fully equipped kitchen that’s made even more lavish with a specially imported kitchen cabinet as well as a set of high-end kitchen appliances. A world of pleasures surrounds Hillcrest Villa. Just a convenient stroll away lays Greenwood Avenue, an enclave of exclusive eateries, bars and other necessities like a supermarket. What’s more, simply minutes from Hillcrest Villa rests Holland Village, a favourite hang-out spot among the expatriates that’s full of chic restaurants and trendy coffee outlets. Singapore’s shopping capital, Orchard Road is minutes from Hillcrest Villa too, so residents can embark on a shopping spree anytime they fancy. Enjoy the convenience of having an abundance of choice schools as Hillcrest Villa is surrounded by some of the best in Singapore - Raffles Girls' Primary, Nanyang Primary School, National JC, Nanyang Girls' High School, a wide selection of International schools and so many more within walking distance from Hillcrest Villa. Hillcrest Villa is accessible via the nearby Pan Island Expressway (PIE) and the Bukit Timah Expressway (BKE). Public transport is readily available along Dunearn Road. Spacious cluster landed living with condo facilities and near Downtown MRT Station. Close to MRT, town and spacious house with 5 bedrooms, nice cosy community, and close to good schools! A luxurious Tropical Villa POPULAR WITH EXPATS COMMUNITY, with full recreational facilities and private security . 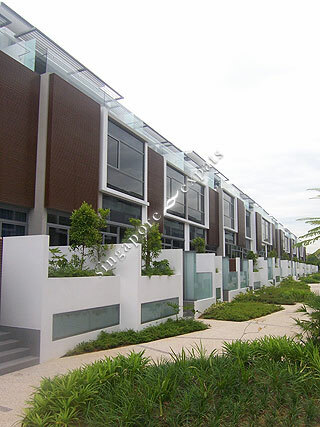 Located at Bukit Timah, a Prestigious District 11 address. Next to Raffles Girls Primary School & within 1km from Nanyang Primary School, Hwa Zhong International School, Nayang Girls High & National Junior College. Stone throw away to future MRT station. HUGE living space for Singapore! Excellent location. Near Amenities. Central location , minutes to Orchard area . Spacious within the house and within the compound area . Project has recreational facilities . Best of both worlds ( condo facilities + house ) . 163 units of terrace cluster houses sitting on a big plot of land with more than 200 square feet allowing your kids to enjoy the space, playing with your neighbors. I am a tenant and visited the place. claustrophobic feel. Every unit faced each unit it badly lacked privacy. Could not feel it for my money.